Actor Ranveer Singh is leaving no stones unturned for promoting his upcoming film ‘Gully Boy’ alongside Alia Bhatt. The actors are seen at various reality shows and events to promote their film. Ranveer, who is portraying the role of rapper in the film, recently reached Lakme Fashion Week in Mumbai to promote his film. 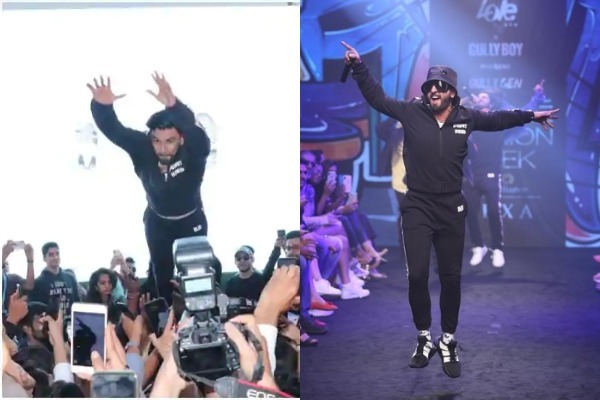 Ranveer was as usual high on energy and gave an electrifying performance on Apna Time Aayega and Asli Hip Hop from his upcoming film ‘Gully Boy’ on ramp. After completing his act, the actor took off his rapper’s hat and sunglasses and jumped into the crowd, without a warning, which left his fans injured. The fans were busy shooting their favourite actor on their smart phones and hence no one expected the sudden dive. As per the reports, many people were hurt and a woman was seen lying on the floor after taking a fall. In the videos and pictures going viral on social media, a woman is seen sitting on the floor after reportedly getting hurt. Soon after this, Twitterati lashed out at Ranveer Singh for his mistimed jump and schooled him for his childish act. A Twitter user wrote: grow up and another said: men becomes wise after they get married.. Please show some signs. Apart from the angry fans, there were many die-hard lovers of Ranveer came to his rescue and said that he didn’t do it intentionally. On the work front, Ranveer – Alia’s ‘Gully Boy’ is set to release on February 14. The film is directed by Zoya Akhtar takes inspiration from the real life story of rappers Divine and Naezy and traces the journey of aspiring musicians from the slums of Mumbai. Previous : Due To This Reason Sonu Nigam Was Rushed To The ICU Of Nanavati Hospital!